46's in the west country Class 45/46 memories in the West Country. Memories from Rob Wosley of his West Country adventures. All photographs courtesy of Rob unless otherwise stated. As has been recorded elsewhere on this website, one of your webmaster's fondest memories from my mispent youth was spent at the south end of Platform 4 at Derby on a summer Saturday watching the comings and goings of the days events, including the many extras laid on for the holiday travellers. I well remember the arrival of the westbound Cornishman and Devonian. The station announcer would reel off a lengthy list of names, exciting, exotic places which were a world away from the delights of Derby. These places had sandy beaches, endless days of sunshine (well so the advertisements said! ), some even had palm trees! And they had diesel hydraulic locomotives in abundance. My journeys over this route always ended at Bristol, my meagre funds wouldn't get me further west until many years later, by which time the diesel hydraulics were working out their last miles. The memories below come from an enthusiast who lived in the West Country, gaining an active interest in the hobby after the diesel hydraulics had gone, a time when the big Sulzer powered Type 4's were in command of the vast majority of inter-regional passenger workings. And later when the Class 50's and the HST's began to replace the previously mentioned Type 4's. The photographs provided are a mixture, some come from the narrator of these memories, his first cameras were the Kodak 110 & 135 models (as mine were), they left us with photographs of dubious quality when compared to our later efforts, but in those hurridly captured early views I think lie some of our fondest memories, so they are included for that very reason. And where possible I have left the author's vernacular intact, with notes explaining things where necessary. The Class 46's were on allocation at Laira for about eight years (1972 - 1980) and involved 46001 - 46028, though of course the Gateshead allocated machines were also ever present on the NE/SW services. It was during 1969 that Bristol gained an allocation of Class 46's, others eventually reached Cardiff, and then of course moving further southwest to Laira. For the Laira fleet the end came after the summer of 1980 when all were either placed in store at Swindon or were re-allocated to Gateshead. These moves did not keep the Class 46's out of Devon or Cornwall, they would still be regular performers until the surviving members of the class were retired in November 1984. But for now hopefully these stories will bring back happy memories. As 1983 opened there were twenty six Class 46's still in service, all were now allocated to Gateshead. Interestingly this group of twenty six locomotives was almost evenly split between the former Laira allocation (46001 - 46028) with fourteen still in service, and the former Gateshead allocation (46029 - 46056), with twelve remaining in service. Classified repairs for the Class had ceased at Derby at the very beginning of 1981, now it was left primarily to Gateshead and Stratford to keep the machines going. A review of the fault reports for these locomotives suggests this was not an easy task. With the end of the Class 46's looming nearer and the threat of the loss of steam heat in its shadow, it was a case of get out while you can and get as much covered as you can. I was still at school, had nothing other than a Saturday paper round and pocket money to finance my bashing, so I was not going to be able to do any MML / NESW overnights or Trans-Pennine moves. I was restricted to Devon, Cornwall and Somerset, with the occasional stretch to Bristol, Cardiff or even Birmingham. There were a bunch of us from the same neighbourhood in Plymouth; Myself, Hatchy, Tweeks, Sean & Paul & Jimbob (The Bishops), Clive and Toby. Hatchy was starting to lean more towards Class 40's and his folks were coughing up for him to go on tours. He did cover some later Peak tours with me but joined the Civil Service and moved away. Tweeks and I spent the spring half term holiday of 1984 at his aunt's in Merthyr Tydfil (complete with snow) covering the Cardiff - Paddingtons with a child season ticket to Newport (Not mega mileage, but a lot of the local trains from Bristol were still Peaks or 33s so it was still Sulzer frenzy time! ), although we did get a day out at Crewe & Chester which saw 40002, 40058 and 87031 produce for us which was quite large. The run home to Cardiff from New St with 45141 is a story in itself! A week later I'd be at Gloucester & Cardiff again, on the Welsh Central Liner railtour with 40035 Apapa in charge, with 45064 inside providing train heat. Clive was getting ready to take his 'O' levels a year early and move onto 6th form & Cambridge because he had a phenomenal brain, but still came out a fair bit. The Bishops would gradually drift towards women and martial arts & stuff, but we had some riotous days out, whilst Toby ended up at college as a hippy. Tweeks became an active Socialist Worker and joined the City Council. Revolution from within, brothers! The one thing that made our bashing more viable was British Rail's Rail Riders club for under 16s, which we all joined. This gave us discount tickets through a voucher system, and you could get more when you ran out by writing & begging. We had no access to Working Timetables, and only got TOPS gen if Johnny Bending or John Galloghly were in the office, the other platform boys thought we were a nuisance, 'bloody spotters'. Older bashers referred to most of us as 'insects', (as they did all the young teenage bashers who appeared during the early 1980's), but we didn't care, we were out to do Peaks and that's what we tried to do. Other guys we hung out with were Chief, a Laira apprentice fitter, Dave Hancock, a dockyard apprentice, and Liskeard, who was in my year at school, (he became my best man and now works for a large freight TOC). These guys were 'in' with most of the Peak Army, as they had more funds than us and got out more. Dead useful for gen and great fun to be with. Most of us covered the York Merrymaker with 46010 & 46032 (see story below), and that October Clive, Dave Hancock & I did F&W's Moors Marauder tour to Whitby with 40122. Originally we booked seats to get the hydraulics (D821, D7029 and a Class 14), the Clayton and the pair of DPS Deltics in on the NYMR. We weren't expecting the Class 50 that worked back from New St to fail and be replaced with 45143 at Gloucester though! That really made the railtour for us! The summer weekdays of 1983 were not much cop around the Exeter area with most loco-hauled services being worked by those vacuum devices!. By August 1983 five of the remaining Class 46's had fallen by the wayside: 46021 & 46029 (January), 46031 (April) & 46004 & 46033 (June). August 1983 was a good time to be a Peak enthusiast in the West Country. Steam heat and ETH examples were prevalent on the numerous inter-regional workings and the fill-in local turns that resulted. It wasn't guaranteed, however, as the Brush Type 4 was as omnipresent as ever. Class 50's were either at The Plant, on The Mule or working the Jumbos and Padd sleeper, so they weren't a real threat. They did sometimes pick up the 10:27 Plymouth - Penzance and return which worked off a morning turn from Bristol and was basically a Bath Road chuck out move. This was a problem in the school holidays if a Vac didn't have enough wheels for you, but the number of times I scored 45/1s off it (and even caned in 47152) was more than enough compensation for having to go east instead of west on the rare occasions a Vac dropped. This was a reliable source of over 150 miles of Peak haulage, and back up to Plymouth in time for the 16:35 down stopper, which was either a Laira chuck out or an extension to an inter-regional relief, which produced 45s and 46s regularly. Of course, the loco and stock then came back again getting back to Saltash around 20:30ish which was ideal for walking home across the Tamar bridge (and getting chips and pickled onions in Fore St!). Often you could get over 300 miles Peak haulage in a day and still get to the beach twice, without going to the English Riviera or Dawlish. It's not that I disliked Exeter or Taunton, on the contrary the Devon banks were ideal Peak bashing country for thrash merchants like our gang, but I did like the run down to Penzance. One of the top moves for me that month didn't go into Cornwall at all, though. The bank holiday saw BR run a Merrymaker to York from Plymouth, leaving at early o'clock for a full day in the Minster city. The price was ridiculously cheap so my parents said they'd like to go, would I want to tag along to go to the NRM? Well, the chance to see all that York MPD had to offer was enough to persuade me, but the local Peak fans had been sat in the 'office' on Plymouth's 5/6 for some weeks speculating what would work the train, and whether to cover it. The rival Vac bashers were confident it would be coffins and a big EE thing, and took delight in barracking us about it. Luckily, we had decided to do it anyway (just in case), so I was happy to get Mum & Dad to pay! The day dawned warm and muggy, we waited in the dark on Plymouth's platform 4 for the stock to come in from Laira, and were dreading marker lights in the sky coming out of Mutley tunnel, which would have meant a Hoover. To our delight the nose of a Peak appeared instead, and there was a cheer from several of us as 46010 materialised with a full rake of tired Mk1s, mostly compos. What a result! We had relatives just outside Edinburgh and had often been 46-hauled to York in the 70s, usually for one of those twin-engined oil-throwing monsters to take us on across the border, so this brought back fond memories. There was quite a turn out from the local roadshow and this led to some happy banter and lots of droplight hanging all the way to York. The use of compo stock meant most of us had access to a window, quarterlights opened as wide as they could go, if you stood on the seats either side two of you could enjoy the thrash. Naturally, I didn't do that in front of my folks, my Mum was a nurse and would have had forty fits! The assaults on Hemerdon, South Brent and Dainton were conducted with vigour by the driver, who obviously enjoyed making the 46 sing. We were all acutely aware that time was running out for the 46s, so the chance of a very cheap day out to York behind one was a real bonus. The sea wall saw much armwaving to the early morning dog walkers, at that time of the day the bikini-clad legions were still in bed! (If my folks had ever come out with us lot on a Saturday I feel sure I'd have been grounded!). The stick was back to full notch on several occasions during the morning, with the accompanying cheers of the Peak fans getting more boisterous as we picked up more bodies en route. The storming of the Lickey led to much cheering, although we were going at a rather stately pace by the time we crested the top. The usual 'stop-start' approach into New St followed, then we were out into the light again and bowling past Saltley and towards the Trent. There is video footage of the train running through Derby on an old video I used to have that was just called 'Peaks', the rasping coughing clatter of the exhaust is perfectly picked up, with the turbo screeching fit to explode. I don't recall who released the tape, but it was damn good. The run through Chesterfield and it's infamous crooked spire saw some spirited driving, but the clouds still refused to lift and most heads stayed inside the carriages. On arrival at York there were one or two seminar shots taken, I've not got one as my film jammed going around the NRM and so all my record shots of 010 were lost, (including some nice ones of her resting on the MPD). On the way back from the museum the sun came out and we spied 46018 stabled at the north end of the station, which set tongues wagging about what would work back. Knowing our luck it would be a Brush, but it didn't really matter as the Peak had done so well on the way up. A few hours fester produced 45059 on an inter-regional, some 45/1s and then 40079 on a southbound local, which we had to investigate for novelty value. A Brush back into York and watching pairs of bombs whistling in and out for a while led to it being nearly home time. My folks met me on the platform, having thoroughly enjoyed their day out around the Minster and the city in general. The train was announced and a cheer rose up again from the assembled bashers as a Peak appeared on the stock yet again. It was obviously a 46, and that meant potentially huge mileage of 010, but no, it was 46032, which was a score for me. Many of us were more than happy with this despite her slightly staggery appearance and there was much bellowing and armwaving as the driver thrashed our somewhat sickly beast away into the afternoon sunshine. He nursed her as best he could and soon she was sounding much more healthy, the steady exhaust beat slightly more raspy than that of 010, but not at death's door just yet. There was life in the old beast yet, obviously, evidenced by the gradual improvement in acceleration as we headed southwards. The barrage of sound in New Street's myriad tunnels was like music to my ears. She fair romped down to Bristol, then raced across the flats to Taunton, before gallantly hurling herself at Whiteball. This proved little obstacle to her, and before long we were past Exeter and saluting the same dogwalkers at Dawlish out for their evening constitutional as the sun dipped towards the horizon, turning the sea gold. The 12LDA28-B was singing like a choir; Stoneycombe, Rattery and Tigley banks were each taken at a full run, much to our delight. Sparks spiralled from her exhaust into the gathering twilight. The run through the outskirts of Plymouth with its headlong rush down Hemerdon saw my parents starting to fuss around ready to bail out, my Mum bemoaning the blackened face and matted hair of a son who'd spent too much time windowhanging enveloped in that sweet diesel exhaust. Once home they cut 46032 off and ran her around, that familiar Sulzer clatter reverberating around the station, before she hauled the stock back out to Laira and a well-earned rest. A great day out, and a fitting way to experience the majesty of the 46s. Both these Class 46's would survive into 1984, 46010 remaining in service until November 1984 whilst 46032 succumbed to fire damage during April 1984. A North Yorkshire Moors gala back in 1983 led to the running of The Moors Marauder by F&W from Plymouth to Whitby. The motive power was definately anything but Sulzer powered (50024, 40122 & 37066 out with 40122 & 50021 for the return). On the return leg 50021 took over at New Street but suffered a failure somewhere in the Lickey area, but still with enough ability to reach Gloucester. Here 45143 dropped on as a replacement. My Lords, although having had 45143 several times after this trip, this night sticks in my mind. I had got my head down when they put the vac on, only to be roughly shaken awake by my pal because the Peak was coming on. I stayed out of the droplight all the way home, as a result 45143 would become a favourite! During October two more Class 46's were retired, 46009 & 46039. The last 'summer Saturday' was October 29th, so a few of us went out to see what would produce on the 10.04 Newquay - Newcastle, (which was 1E22 in 84). Some Brush 4 rolled in, but we were happy because 46045 had been idling in the siding next to platform 8, and we KNEW what was working forward. Coach A was rammed with bashers of all ages as the big Sulzer backed on. The Bobby set the road, we were given the tip and we were off. The route from Plymouth to Exeter runs out through the suburbs of the city and onto Dartmoor. Immediately after the station there is the old east signal box and Mutley tunnel, the face cunningly disguised by a multi-storey car park. The exhaust note of the Class 46 reverberated around in this cavernous space before we entered the tunnel proper, with the turbo note becoming shriller. Once beyond the tunnel there was a little more power application before the driver shut off and we coasted through Lipson and past Laira MPD to our right. No other Peaks visible today, the driver pulled the stick back again, a pillar of black clag from the exhaust and we swept left past the Bass brewery at Marsh Mills, out through Tavistock Junction towards the site of Plympton and the notorious Hemerdon Bank. By now the cool autumn air was starting to nip our faces, the loco was easily at line speed but all too soon the weight of the train was beginning to tell as the long gradient began to steepen. The barking cough of the exhaust became more pronounced as we gradually slowed. People in their allotments behind Stoggy Lane waved as they leaned on their forks, we cheerfully acknowledged while the warm scent of burnt diesel washed back over us. At the top of the bank the train began to surge forward, the turbo shrieking as photographers in the layby got their record shots. The loco ran like the wind now, climbing forward through South Brent and Ivybridge up to Marley Head, with it's twin bore tunnels plunging us into darkness before the long descent down Tigley & Rattery into Totnes. On through the middle road, driver making the most of the trainload to boost the loco for the assault on the climb to Dainton Tunnel. A short sharp climb past the box and we crested the hill in the centre of the tunnel, fumes rebounding from the roof, the loco's labouring engine amplified by the stonework. Then we were coasting down to Aller Junction, where the Paignton line diverges, and on the long straight into Newton Abbot. Bellowing at the cars and people stood at bus stops, we were revelling in the thrash from this old machine. We ran up the old through road (now a car park!) and she opened up as we passed the East box, where the Heathfield branch once diverged. Out across Hackney Marshes, some of the number hunters looking for P-way machines, we thundered on towards Teignmouth. Running alongside the river we waved at campers and beachcombers before entering the station cutting with the deafening racket of the Sulzer and our cheers greeting the people waiting for the next local east or the next Paignton train west. Then we were on the famous curve on the Sea Wall, late holidaymakers strolling along in the sunshine. The loco just kept surging on through the numerous tunnels towards Dawlish, where our cheers got louder as the bay opened up before us. Taking the curve at Dawlish Warren at speed, we were caught on camera by the few hardy souls on the rocky outcrop where trains have been pictured since the days of the Castles & Kings. Passing the camping coaches outside the station, we cheered again as the Railway Museum curators and visitors ran out onto the platform to see us pass. Out through Starcross now, the river Exe on our right, winding past Brunel's Atmospheric Railway museum and onto the flatlands that lead into Exeter. The driver was really ragging her now, catching your breath wasn't easy but we were so happy to be out of the windows experiencing this beast. Running into Exeter across the girder bridge we were passed by another Class 46 on a Paignton train, the bashers in coach A calling to us and saluting. We never did make the connection for that one, a definite men-of-steel move that must have been minus 5. Gradually the brakes came in as we snaked across the pointwork and alongside the platform. Those of us who weren't going on bailed out and took photos while there was a crew change, before saluting the monster on her way. Getting home was going to be fun, I didn't have a clue what was going to drop, and to be honest it didn't matter, when a Class 33 came down the bank from Exeter Central with a Brighton - Plymouth additional. There wasn't much chance of it working forward unaided across the Devon Banks, so you can imagine our delight when 45070 rumbled out of the stabling point and ran out onto the crossover before backing onto the train, leaving the Class 33 to follow us out of the station to crossover for fuelling. Coach A rapidly filled, Dave & myself securing the first droplight window. There was little point sitting down! Soon the road was given and the big machine eased the train out across the river and began to accelerate through the centre of the city. By the time we were running through Exeter St Thomas full power had been applied and the loco was screaming. How I managed this photo with Dave hanging out of the window with me I can't quite remember! A headlong charge towards Powderham Castle, Cockwood Harbour and Starcross ensued, regular fine adjustment of the regulator leading to more exhaust plumes surging skyward. This was the time before continuous welded rail had taken over the Western Region, the loco's sixteen wheels clattering almost constantly across the joints where this new innovation was yet to appear. The sound as we roared through Dawlish Warren and out onto the sea wall was reminiscent of the Edinburgh Tattoo. By now the air was even cooler than the outward run, faces were becoming numb but nobody wanted to be the first to sit down, the music of the big Sulzer power unit was too good to miss. The rapid succession of tunnels made the sound of the loco batter us in waves, more power applied and we leapt on through Teignmouth, a cacophony of metal on metal reverberating around the station. Slowing for a stop at Newton Abbot, before long we were racing towards Aller Junction and facing the stiff climb to Dainton Summit. The road snakes past Stoneycombe Quarry during the ascent, and then you're faced with the tunnel itself, short as it may be it enshrouds the crest of the bank. Blasting out into the sunshine again the loco ran hell for leather down into Totnes, for the even stiffer challenge of Tigley & Rattery banks. 45070 powers through Exeter St Thomas on the fine afternoon of October 29th 1983. 45070 would remain in service until April 1986 when a main generator fault stopped the locomotive at Thornaby. 45070 was removed to Derby and remarkably received a replacement main generator which provided another nine months of service, finally being withdrawn on January 29th 1987. As we made our assault on the hill in the shadow of Totnes Castle the residents who were in their gardens looked up and waved to us, some of them even began to recognise us by the following summer. The loco worked hard and finally we were through Marley Head, levelling out and skirting the edge of the moor. Some more fast running ensued as we flashed through South Brent, and before long we were racing down Hemerdon Bank, the characteristic rumble of the brakes echoing out across Plympton. We swept past Laira and on up through Mutley Tunnel. Our journey was at an end as we rattled across the North Road pointwork, it was time to say goodbye to the summer timetable and the noble beast that had helped make it such a memorable day. 46045 would survive until the very end of the Class 46 era, ironically ending its days working in the South West in the third week of November 1984. 1984 sometime - 46014 had just run into Plymouth on a relief and was then utilised on the 16.25 stopper to Penzance, needless to say I was late home that (mum & dad knew if I called and said 'there's a 46.....' they were in for a late one). 46014 also worked the return stopper, allowing me to get off at Saltash and walk over the bridge, getting home about 22.00 - my tea was still in the oven! 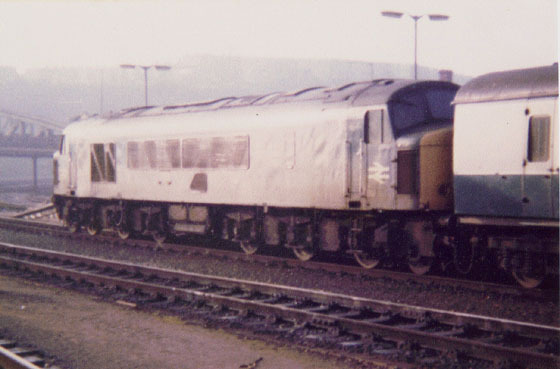 46014 was the last Class 46 to receive a General at Derby, completed August 1980. It was finally condemned on May 6th 1984. 46026 with the 1E22 Newquay - Newcastle leaving Platform 6 with the first coach well populated by the local chapter of the Peak Army. This day I was skint and the gripper was a desperado.....so I was forced to remain on the platform end! 46026 was well travelled in its last months of service, including visits to Devon & Cornwall. Withdrawal came in the middle of November 1984, having been stopped with multiple faults at Gateshead. A bitterly cold January 1984 day finds 46027 coming to the rescue of an HST. It had been taken off a freight at Plymouth to assist an ailing, well almost comatose HST, the front powercar was completely dead, the rear one was idling only so it was left to 46027 to drop down on the front and head east over Hemerdon & Dainton banks. Laira had no spare power cars available, so the four Plymouth bashers on the train to Exeter had a rare memory to tell. Before the year was out four more Class 46's would be withdrawn, 46023 in November and 46016, 46018 & 46051 during December. This left just fifteen in service at the start of 1984. Withdrawals in the first half of 1984 included 46017, 46032 & 46044 (April), 46014, 46028 & 46046 (May) and 46037 (June). This left just eight in service to work out what would be the Class's last summer in service, with many continuing to be found working in the West Country. 46052 would be the next Class 46 withdrawn, taken out of service during September. The remainder would all soldier on until late in November when all were taken out of revenue earning service. The last seven machines were 46010, 46011, 46025, 46026, 46027, 46035 & 46045. The May 1984 timetable was much more interesting with the Newcastle trains (1V85 & 1E91) booked for GD 47's and the dated Leeds services booked for 45/1's. Both the 06.35 Bristol to Plymouth and the 07.50 Bristol to Penzance returning as the 13.45 Penzance to Bristol also regularly produced a 45/1 or 47. By this time York Clifton still retained five sets of MK1 SH/VB stock, which were regularly used on relief trains, especially the 10.30 York to Plymouth/Penzance, 14.25 York to Plymouth and 11.00 Plymouth to York, all often producing a steam heat 45 or 47. The 14.25 ex-York relief ran nearly every Friday throughout the year whilst the other reliefs would run most Thursdays and Fridays during the summer and at holiday times in the winter. Other relief trains ran too during August and holiday times, but the York reliefs were the ones to cover for NB/SH Peaks and 47's. Happy days ! This was a tour starting from Plymouth with unspecified haulage to Bristol, then a Class 46 to Birmingham - Leicester - Peterborough - March - Kings Lynn, Class 37 back to Cambridge, then the Class 46 again, on to London - Basingstoke - Bristol, and the last leg back to Plymouth was unspecified traction! I had arrived bleary eyed at Plymouth North Road at a ridiculous hour to find the tour chalked up with the legend '46026 RIP'. Lo and behold she rolled in with the stock and worked through to Kings Lynn, including a sterling effort up Lickey. At Kings Lynn 46026 ran light to Cambridge for refuelling. 37134 worked the short Kings Lynn - Cambridge leg with 46026 joining the train again, I was in the front coach, first bay, so got to enjoy the great performance of the Peak all the way home, in particular the runs over the Devon banks. For those in the know 46026 would return north next day on a Plymouth - Newcastle, but since I was only fifteen at the time on a paper round budget not much milege could be afforded this day! Kings Lynn - 46026 on the stops about to run light to Cambridge - I'd imagine that at the best of times the Peaks were very rare visitors to this part of the world. Cambridge Depot - 46026 stops by to top up its tank prior to returning to rejoining the railtour for the long ride back home to Plymouth. Class 46's were no strangers to Cambridge, being frequent visitors on services coming out of Kings Cross. Just prior to working the 'Lynn liner' tour 46026 had been stopped at Bescot on October 23rd with camshaft problems, it was forwarded to Gateshead where repairs were made, being released to traffic on November 1st. By November 6th 46026 had encountered fuel problems, it would be failed at Severn Tunnel Junction on 9th with flat batteries. I have several very good memories, although they're not massive mileage turns or all 'men of steel' moves they were still Peak moves and worth doing just for that. One of my most memorable days out actually started as a day chasing 50s though. In early 1985 I met up with one of my bashing mates (called Dave) who also did 50s and agreed to spend the morning getting some EE action in the book. There was a booked pair of Hoovers up line on what they used to call the 'jumbo', a 13 coach Penzance - Pad monster of a train that was always a firm favourite with the 'vaclads'. We covered it from Plymouth to Exeter where there was a plus 30 odd for the next vac back. This we duly did for a fill-in vac turn back up to Newton Abbot. The next move was back to Plymouth booked for a 50 again. Here things started to unravel quite badly for Dave as it produced 47/4xx, which staggered back over the banks. The up Liverpool inter-regional had gone over to Hoovers but dropped 45108. Things started to get quite interesting then because all the vac men were bowled on the up for a few hours, so in order to cover either down trains or The Mule (Waterloo line) they had to take the Peak. 45108 was a monster and performed like it was going to blow a gasket all the way to Exeter. The down Liverpool also then failed to produce a 50, dropping 45102 instead. This was one of the very few times I ever had her and she was enormous. Great thrash, the Bristol driver obviously knew his stuff. Dave had by now resigned himself to the fact that vac moves were out of the window. I opted to bail at Newton Abbot to cover one of the infamous York reliefs which was behind us, which there was a rumour might produce an ex-Doncaster 50 from refurbishing. What did we get? 45116! My Lords! There were several by now very unhappy 50 men about, who were not well pleased wth the sequence of events. But their reputation had preceded them and two plain clothes BTP men were present in coach A, which was very interesting. On arrival at Plymouth the up stopper produced 50024, and I turned that down to do the next up inter-regional. One of the vac men took exception to me dismissing the Hoover saying they were 'the only premier motive power', the vacman's response was of no credit to the enthusiast movement and led to the BTP boys, who had joined the train (they were obviously shadowing 50 hauled trains) earning their keep. But we had the last laugh when 45124 rolled in on the adjacent platform on my train. The vacman was frogmarched off to cool down so Dave and I jumped on behind the Peak and after the stopper had cleared the section off we went. We were non stop to Newton Abbot so looped the stopper at Totnes, giving the vac boys a cheery wave as we went by. And the vacman?? Well he was being escorted onto a train (HST) by the BTP when we disembarked from our train home, which was 45140. Some six years later I saw him again whilst behind 50007 on the Plymouth - Waterloo SO in 1991. I was covering this to go to a beer festival at Salisbury with some mates. He nodded in acknowledgement but I don't know if he really recognised me. This train was a famous train in Peak Basher circles, solid for steam heat in 1983 & 1984. The Class 46's were frequent performers and were very saught after in 1984 as their swansong approached. 46026 covered the working several times whilst 46010, 46035, 46037, 46047 filled in amongst the more common Class 45/0's. Regrettably Class 47's could also show as did one HST. When these machines showed up they would be flagged and we'd wait for the Up Leeds two hours later. A good move for the not-so-rich Plymouth teenagers, including your scribe, was to cover the 1E22 to Exeter to pick up the Brighton - Penzance, this was usually steam heat and frequently a Peak. Declassified firsts were often used on this working, which I could take to Saltash followed by the walk home. Peak bashing in the West Country isn't just about the Sea Wall or the Devon Banks, there's the torturous route to the blocks at Penzance to consider too. During the school holidays in the early to mid-80s I'd often find myself at a loose end on the island platform (5/6) at Plymouth. Most of my pals were taken off elsewhere by their families, but being the last one at home meant I was more of a free agent. The lure of the route across the Royal Albert Bridge with a sixteen wheeled Sulzer was often too much to resist. I could walk into the station from where I lived in a little over half an hour, or wait at the branch halt at St Budeaux Victoria Road for the two-car slam door Class 118 DMU, usually set P480, for some 'boggo' thrash. One such morning mid-week found me cabbing 45130, which would be the traction for the 10:27 stopper to Penzance. The obligatory record shot taken (below), then it was time to sit on the station BRUTE trolleys and consider my options. A chap from the East Midlands wandered down the platform to take a few shots of the big machine, and pointed out the nameplate studs on the bodyside. Apparently the loco was due to have been named Newmarketeer some time in the 1960s, after an East Anglian regiment, but the plates were never fitted. He claimed that the name was allocated to her and listed in some ancient Ian Allan book, which was well before my time. If anyone can corroborate the story I'd like to know, because I was really interested. Still unsure what to do, I spied my source of official gen, Johnny Bending, one of the platform staff. He reckoned both up inter-regionals were Brush, so I went out to the ticket office and got a return to Penzance. A quick record shot then the film in the camera started to whirr, which meant that I had no more film. Disaster! Settling down in the first compo in the front coach, I made myself comfortable for the long trip west. The route is only 79 miles, but due to its twists and turns and gradients it takes a good two hours. Here is 45130 with the 10.27 Plymouth - Penzance, just another routine trip for the Class 45. During 1985 this would be one of the Peaks to make a rare appearance at Brighton on a scheduled service, deputising for a Classs 47. 45130 made this journey on December 7th 1985 with the 07.48 Wolverhampton - Brighton. The end would come on May 10th 1987, withdrawn from Tinsley, but not cut up at McMetals, Glasgow until June 1993. The short (4 mile) run out through the Plymouth suburbs passes Devonport, Dockyard Halt, Keyham and St Budeaux Ferry Road. The line from North Road crosses an overbridge spanning the main route into the city from the west, then swings right across a curved viaduct. The trackbed just before the viaduct is wide and there is evidence of where the route to Millbay Docks once ran off to the left. There's a gentle incline into Devonport, the line curving right again into a short tunnel. A quick tug on the regulator and the train powered past Dockyard Halt and over a high viaduct over Ford. To the right there stood the Southern Railway's viaduct which once carried the line from Devonport King's Road (now the City College) to St Budeaux Victoria Road and Tavistock, Okehampton & Exeter. The viaduct is gone now, as is the line from Bere Alston to Meldon Quarry! The loco opens up even more and we pass Keyham, with its old goods shed and trackbed empty of rails, then clatter over the crossover into HM Dockyard where the flask trains go for nuclear submarine refits and where latterly locos have gone for refurbishment. Just west of the crossover is the imposing metal bulk of Weston Mill Viaduct, crossing the creek at Camels Head, which feeds Weston Mill Lake. We always called this structure 'Shaky Bridge', anyone who was using the wooden footpath that was attached to one side will know why! With the use of Weston Mill Lake as a berth for warships and the advent of 9/11, the footpath is now closed, but 23 years ago you could stand there all day and get ballast level photos of your favourite trains. Coming off the bridge we would cross another spur to RNAD Bull Point (now lifted), where we used to speculate that Cruise missiles entered the UK. (They didn't, but local legend says they came by sea at night, and were unloaded on the River Tamar!). Then there is another crossing, where the line for Gunnislake now diverges. The route of the old SR line can be seen to the right, which swept in and ran parallel for a short distance. Power on again for the climb out of St Budeaux Ferry Road, crossing a box girder bridge over the Gunnislake line which curves around and below from Victoria Road, then into the cutting between the houses in Pemros Road and Vicarage Gardens, before you reach the approach to The Royal Albert Bridge. This track bed used to be twin all the way to the end of the cutting, but was reduced to single in the late Sixties (I think), twin track ending at Ferry Road now. The train threads across the Royal Albert Bridge, hardly any need for the throttle at all with a 25mph limit, then gently comes to a stand at Saltash. Back then there was a GWR footbridge across the line, this is sadly gone now, you have to leave the station and cross via the road bridge at the end to get to the other side now. A touch on the throttle as the guard gives us the tip, a quick throaty roar from the loco, and we were out of the station, past the old goods yard on the right, and crossing the first of several viaducts on the way into deepest Cornwall. The line curves around the hillside, the driver making full use of the line speed to accelerate away. As he poured on the power we rushed through the derelict Defiance Halt, where naval recruits used to detrain for their onward journey to the RN training schools at Defiance and Raleigh. The train swept through cuttings and soon we were crossing Forder viaduct and plunging into Wivelscombe tunnel. Out into the sunshine, power on again and out over Notter Viaduct. We're soon at Trerulefoot, where the line runs up a gradient next to the Torpoint road before crossing the A38 and coasting downgrade to St Germans. The line crosses a short viaduct on the approach to the station. The house next to the little used halt was owned by my schoolfriend Guy's family, lucky fellow! The line crosses more viaducts at Tresulgan and Coldrennick, before the Peak was surging through Menheniot and out over Trevido viaduct, a mile to the west. Cows and sheep litter the rolling green fields to either side, and the train crossed three viaducts in quick succession on the approach to Liskeard; Cartuther, Bolitho and the huge Liskeard, (nearly twice the height of Cartuther at 150ft), with the Looe line crossing below it. The 118 unit was in the bay on the branch station to the right. There's a prolonged stop for our Peak at Liskeard, the big Sulzer engine thrumming away, the exhauster chattering gently, as the Looe line people disembark or join the train. The driver acknowledges the flag and whistle with a touch on the horn, just a quick high note, then the brakes are off. There's a slight jolt, a little more power is applied, and we coasted downhill towards Bodmin Road (Parkway). We soon crossed Moorswater viaduct, with it's length at nearly 1000ft and 147ft high it towers above the industrial estate below. The Looe line can be seen below again. The driver gave her a bit more throttle and the exhaust note became shriller. Dirty brown clag belched into the sky before running clear, and the loco ran like the wind, the big body swaying as the speed picked up. Across Westwood viaduct we're in the Glynn Valley, heavily wooded, with rhododendrons prevalent. The line is singled to cross St Pinnock viaduct, at 151ft the highest in the county. The line towers above Trago Mills shopping complex, I had no idea that this small out of the way store would become the giant it is in the 21st century! We're assaulting Largin bank now, Largin viaduct swiftly followed by West Largin as the loco began to work harder. Derrycombe, Clinnick and Penadlake viaducts follow, the line clinging to the twisting hillside, and we're at Bodmin. Only a few years previously the line from Wenfordbridge saw Laira 25s and the odd 46 bringing China Clay Hoods down the bank (Called the Wall of Death now by the diesel volunteers on the Bodmin & Wenford Railway) into the exchange sidings. The slamming of doors, people milling about chattering as the families disembark for the wooded walk to Lanhydrock House and its beautiful grounds. Another touch on the horn as the guard is given right away, and that familiar Sulzer chugging is echoing around the valley. We passed through the short Brownqueens Tunnel and ran down to Lostwithiel. Here the Fowey branch diverges, where the diesel hydraulic giants of the D1000 class plied their china clay trade only seven short years before. We crossed the Milltown viaduct and entered the plunging darkness of Treverrin Tunnel, which leads us to a short downgrade to Par. The stiff climb past St Blazey had the driver pulling the stick back so that the regulator was wide open. The big loco soon found her feet and we were soon in St Austell. Another brief respite for the Peak, that familiar Sulzer tickover clattering off the station buildings. Then we were off again, out over the viaduct and past Trenance sidings. Another viaduct at Gover and the Peak was storming through Burngullow, clattering over the pointwork for Drinnick Mill and through the remains of the old Burngullow station. We crossed Coombe St Stephen and the Fal, the river glinting in the summer sunshine, and the loco was now shrilling away, the exhaust blowing hot into my face. We charged on through Grampound Road then Probus, the eerie lunar landscapes of the China Clay slag heaps gradually giving way to relics of a much older industry, tin. Over Tregagle viaduct and through Polperro Tunnel and the much shorter Buckshead, the train was at line speed but you knew the driver could get much more from the big Sulzer. As is to affirm it he opened the regulator again and the engine note climbed the scale as we crossed Truro and Carvedras viaducts. The brakes began to bite, that familiar thudding rumble from the Mk1 carriages, we bowled across the level crossing and slowed to a stand at Truro. The train lost more people off to Falmouth on the branch. Slowly we pulled away from the platform and entered the tunnel before accelerating out of the darkness. The exhaust swirled into the compartment and soon we had traversed the pointwork for the branch at Penwithers Junction. Over the well known Chacewater viaduct and the seven or so miles to Redruth were easy work for the big beast. A short tunnel precedes the station, then after a short stop we were rumbling out over the viaduct and going deeper west. 46009 approaches Redruth station as it works north with a NE/SW working. Clouds hang low over Redruth, but it appears blue skies in the background are not too far away. Above the locomotive can be seen the castle and monument at Carn Brae. The short hop over to Camborne through windswept Carn Brea sees another station stop. There were another three viaducts to cross before we pulled into Hayle, once en route we crossed the site of Hayle Wharves junction and idled over Hayle viaduct, before the driver put the brake in again and drew up to the post at St Erth. A pair of 127 units stood in the bay for St Ives, dirty smoke blowing from their bullhorn-like exhausters. Their numbers, which began 55xxx, led to some of us dubbing them Western Region Deltics, and in fact some of my pals said they'd rather have the 127 for haulage! The platform chargehand gave the guard the nod then 'blew up', his BR whistle shrieking. The guard flicked his green flag and before his hand was back inside the van the driver had released the brakes with a hiss. A brisk low-high note on the horn and 45130 was shuddering away from the station. Crossing the points we entered the single track at Marazion and swept across Mounts Bay, with St Michaels Mount rising from the sea. The gulls were wheeling over the beach and we slowed for the crossing at Long Rock. Not much on the depot as we trundled by, and too soon our journey was at a close as the loco drew up to the blocks at Penzance. 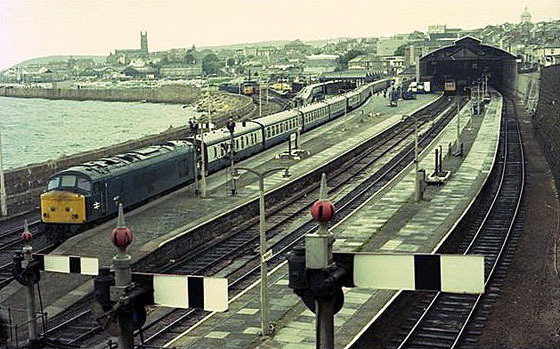 Photograph courtesy Andy Hoare The end of the line for trains in the south-west, Penzance station sometime during June 1979, 46017 waits time for a NE/SW working. Not much to do but buy a pasty and a drink, wait for the station pilot to drag the stock out and release the train engine to Long Rock for fuel. I sat in the sunshine on the platform end, my back against a rusting BRUTE, and watched as 45130 returned from her refuelling and backed onto the stock. Time to find a seat for the long trip home, no compartment this time, just a table next to the guards van, and I was ready to do it all again in reverse. The 06.18 Plymouth - York was a Sulzer type 4 move. Sometimes a Brush, but more often than not a 45/1. I don't recall a 50 dropping on it in all the time I used or viewed it, anyway. I was due to spend a week at Merthyr Tydfil with Tweeks and his relatives, ostensibly to cover the South Wales area for diesel moves, in the February half term of 1984. We weren't entirely sure what we would end up caning in, but if the 06.18 produced it would be a good omen for us. First indication that God was on our side when we arrived at North Road station was the sight of Laira man and top Peak basher Kev Coombes in the concourse. Kev was a much respected basher, and he always welcomed the new bloods like ourselves, even when the other 'top men' were calling us 'insects' or shouting 'who are you?!'. Second heads up was the thunderous clattering of a big loco running round, accompanied by the stuttering cough of an accelerating Sulzer 12LDA28B. At the London end of platform 4 we were more than pleased to see the huge bulk of 45118 Royal Artilleryman backing onto the train. Things were definitely going our way. Normally you could expect a dozen Peak men in coach A, but given the time of day and time of year the 'normal' count was relatively low - in fact we were the only occupants of the carriage. As it was a MK2A type this meant there were enough droplights or quarterlight windows for everyone to lean from to enjoy the glorious sound of Sulzer diesel thrash, if they were mad enough to want in the near freezing February morning. Fingerless gloves on, scarf on under my combat jacket, I was all set for some classic Sulzer music. Tony Clamp & John Galloghly blew up on the platform, white bardic lamp showing, the guard (might have been Kev Mooney, can't remember), acknowledged, John buzzed the bobby and we were given the RA. A flash of the guard's lamp and more whistle blowing and the driver released the brakes. A nudge on the throttle to free things up led to another two touches to let the big loco dig her heels in. As the familiar Sulzer clatter reverberated around the houses backing onto the station we rolled forward across the parcel bay turnout and made our way across the ladder of pointwork to the up line. A lone dogwalker was treated to some armwaving and a bit of bellowing as the driver opened her right up and she shouted to the sky, a plume of grey exhaust leaping from the roof. The turbo was screaming as we were enveloped in the blackness of Mutley tunnel, and accelerating onwards towards Laira. Green lights all the way meant a fast assault on Hemerdon bank, the cold air of a cloudless early dawn tempered by the heat of the exhaust pouring out over us as we leant out to hear the Peak thrashing uphill. Skirting the edge of Dartmoor the loco ploughed forward, big body swaying as we leant into curve after curve. We rattled across viaducts at Bittaford, Blatchford and Slade as we screamed through Ivybridge. Hammering through Wrangaton we assaulted Aish gradient before romping through South Brent and were soon penetrating the twin bore tunnels at Marley Head. The deafening Sulzer beat echoed in our ears, making conversation impossible. There was the odd touch on the brakes as we careered down the inclines at Rattery & Tigley and around the sweeping curve into Totnes. A brief respite to pick up passengers, a blast on the low note and we were away again, the noise from the loco reflected back by the huge structures in the St Ivel dairy to our left. The driver nursed the big beast into a frenzy for a spirited charge at Dainton bank, but it was hard going at the summit, clag filling the carriage as we blasted through the tunnel. Another headlong charge downhill past Stoneycombe ensued, before Aller Junction was behind us and we were streaking down the long straight into Newton Abbot. Brakes on hard as we drew up to the platform, the dereliction of the old works was obvious even then, but I still recalled Peaks and Westerns stood in sidings there when I was a young boy. The departmental train heat class 24 had only left a couple of years previously, it seemed a shame that this one time home to the Warship class hydraulics was just a gutted shell. A glorious sunny day at Newton Abbot, date unknown as 46036 heads west with a NE/SW service. Paignton branch users set down and picked up, more platform activity, whistles and lamps and we were away again, passing the old Motorail terminal and the Maltings, clattering over the Heathfield turnout. The driver gave the odd touch of the throttle until we crossed the river and suddenly opened her up to full throttle and 45118 leapt forward through Hackney yard, racer for the banks of the Teign. The eastern horizon was tinged red as we erupted from the stoneclad chasm of Teignmouth station, out onto the sea wall. The sea broke gently on the shoreline, foam flecked wave tops glowing white in the gloom, then we plunged into Parson's tunnel. The cacophony from Royal Artilleryman grew to a crescendo, only to be abruptly hushed as we cleared the tunnel. More huge noise in Clerk's tunnel, clag and thrash enveloping us. Another brief glimpse of fresh air and we were in Phillot's tunnel, out again then back into the looming bulk of Coyrton tunnel. We burst back into the dawn light before plunging into the blackness of Kennaway tunnel. Once again the regulator was open wide as we exploded out onto the Colonnade at Dawlish, rattling through the station we hurtled along the sea wall, the racket from the big engine bouncing off the brooding red cliffs. We leaned into the curve at the Warren, power was reapplied and we rocked the camping coaches as we thundered through the station at Dawlish Warren, with its signal box stood sentry over the mudflats. We surged on into the growing morning light, past Cockwood harbour, through Starcross with its Atmospheric Railway museum, past Powderham with a herd of red deer in the grounds, and heading inland for Exminster, along the racetrack-like long straight, where any driver losing time had ample opportunity to get the stick back and make up ground. The brakes were once again applied as we entered City Basin, the train sweeping through St Thomas and crossing the canal and river at Exeter before the harsh drumming of steel on pointwork led us into St David's and another station stop. A rail blue 2-car Class 118 DMU was in the bay, waiting it's next call for the Barnstaple line. How it had escaped the onset of blue & grey livery for so long was a mystery, but the novelty value was high. A blast of low-high on the horn told us we had the road, so heads out again as we coasted over Red Cow crossing. The pub to the right of the same name would be a place where legions of enthusiasts had spent and would spend many happy, if slightly drunken,hours, myself included (though not at 13 years old! ), with Royal Oak ale dispensed direct from the cask and steak & kidney pies hot and fresh to be consumed. Nowadays the pub is demolished, and even Royal Oak brewed elsewhere. The Peak accelerated through Riverside yard and over Cowley Junction as we galloped through the Devon countryside. We bowled past the site of Hele & Bradninch, through Tiverton and then onwards towards Somerset. The climb to Whiteball summit and its infamous tunnel had the turbo chirping and the exhaust barking. By now the sun was up and the sky much lighter, and we were then thrown into blackness. The rowdy music of the Sulzer 12LDA28B was amplified by the tunnel walls, and as we returned to the daylight the loco began to gather speed as we hurtled towards Wellington. Before long the brakes were being applied as we ran through the outskirts of Taunton, passing the cider works at Norton Fitzwarren. The junction for Minehead to our left, we were soon drawing up to the platform at Taunton, the loco fan now roaring as it worked hard to cool the huge machine. The high pitched chattering synonymous with an idling Peak died away as we were given the road. An evacuation of air as the brakes were released, a high note on the horn, and as the driver touched the handle there was a clatter of accelerating pistons. The 137 ton machine lurched forward, found her feet, then pulled us out of Taunton more smoothly. We quickly gathered pace, the exhaust note harsh and guttural but crisp in the morning air, a steady stream of fumes venting straight up. Gradually the clag dissipated as the engine ran hotter, and we rushed onward. Its April 1982 and 45046 waits for the signal to enter Taunton Station. As we swayed across Cogload Junction and the Berks & Hants route diverged off to London, we discussed with Kev what our plans were for our week in Wales. We planned a day at Crewe for a look at either the North Wales line or WCML, but other than that it was straight Newport & back fill-in moves to maximise mileage, if anything was about. We knew some of the locals were Peak hauled, but not having a WTT couldn't plan very well.Kev told us about the Cardiff-Paddington morning train which was booked 45/1, which we were unaware of, and mentioned a Birmingham-Cardiff late afternoon train, that we could cover throughout at least the once if we ensured our Crewe tickets were valid for New St. We then talked about the run down of the 46s and the future of the 45/0s, which was also in doubt now. We rattled over Brent Knoll and dashed through Bridgwater, fan bellowing and turbo shrilling as we hammered through Highbridge and Burnham. It was too cold to stay out for long, so we left the quarterlight open to hear the loco in comfort. A rapid clattering of trackwork announced Uphill Jn, soon followed by more noise as we crossed Worle Jn, where the Weston line rejoined. We eased for a slack shortly after Worle, and continued the more sedate pace through Yatton then Nailsea & Blackwell. Obviously, Bristol had pathed us badly! The pace picked up again though, and we cantered through Parson Street, only to be checked at Bedminster. A 47 on ECS out-accelerated us as we crawled along, but when the road cleared the Peak roared out and we soon passed the Brush. We had our path into Temple Meads, taking a quick look at Bath Road we could see 45133, a 25, 33 and 47, so a solidly Sulzer view for a change. Whether 133 or the rat would work was open to conjecture. Easing into the big train shed we said our farewells to Kev and his chums, 45114 stood on the adjacent platform so it was a perfect opportunity to bail out and get a photo of a pair of Peaks side by side. The early morning February sunshine catches the side of 45108, just arrived at the west end of Temple Meads station. After picking up our weekly seasons we took the next train to Newport, as the Cardiff cranks had all disappeared to the pub or pretended they didn't speak English. Some big steam heat Brush 4 whisked us east, where we bailed out for a fester and tried to get our bearings. Some of the local neds were a bit offish here too, but one or two were okay and were happy to tell us that our staple fare for the week would be Sulzer engined on the whole, mostly Type 3s, with Peaks and 47s finishing the mix. Not that we expected type 2s on the Welsh Marches, we were a bit late for that! If a type 2 did turn out it would be Brush, and we would have to put up with it. This we didn't mind, especially if it was a fill in move for a 45. There was the risk of the odd 50, and of course there were HSTs to avoid, but this wouldn't be too strenuous. So, no surprises. We settled into our week well, and amongst some big runs from Peaks we also had some memorable 33s, like 012 and 027. These smaller Sulzers seemed well suited to the route, nothing too arduous gradient wise and plenty of straight bits to get a good run at. We knew it was only eleven miles or so, but you could fit in quite a few moves in a day and it was worth doing because there could be Peaks involved and above all it was fun. One of the Peaks that dropped for us early on was 45124. When she rolled into Newport she was oil streaked and grubby, the exhaust was brown and the loco sounded completely shot. We expected an interesting ride, and happily bundled into the front coach. Once we had the road the driver gave a quick blast on the horn, which sounded like a 47's, strained and ineffective, then opened the regulator to the last notch. There was a noise like an earthquake in a tank factory, metal clamouring and diesel engine bellowing, the brakes were released with an almost aggressive flourish and we lurched away. The train was only load 6, but already the apparently ailing machine was making hard work of it. She laboured like a 25 on a heavy freight, thick brown exhaust spluttering skywards. Of course, we were enthralled, and our cries of 'My Lords!' and the associated arm waving saw many a raised eyebrow amongst the number hunters on the platform as we staggered out of the station and into the cramped confines of Hillfield Tunnel. The cacophony in this black space was almost surreal, but we were definitely gathering speed. As we emerged into the afternoon sun the turbo could be heard shrilling and the exhaust's strident coughing settled to a more regular rhythm. The fan was roaring like some primeval bovine monster. The sound of the wheelsets on rail joints quickened, and the driver shut off and let her coast for a short distance before opening her right up again, no doubt playing to the crowd!This time she surged forward gracefully like a killer whale after a seal, exhaust plume pouring into the sky. We rattled through Gaer Junction and sped on towards the Alexandra Docks spur. As we clattered over the pointwork the driver shut off again, the big machine bowling along nicely. The driver sounded his horn twice as we approached Long Dyke Junction, although I didn't see a whistle board or a PWay team. A more controlled use of the power handle saw the loco thrashing nicely. All too soon the Valley Lines swept over to our right, power was off again and the brakes were applied. The fan cut in again as we coasted to a stand at the platform. Everyone detrained, and we went up the platform to admire this rather tired looking beast. If we had more runs like that to look forward to, it would be an entertaining week! Despite its concrete edifice, Birmingham New St had an air of brooding magnificence. We'd spent the day at Crewe, observing the traffic and getting a little Class 40 and 47 action before 87031 Hal O' The Wynd had hauled us south. The evening was drawing in, it was difficult enough to see as it was, but a pair of marker lights on a nose and that friendly Sulzer rumble told us all we needed to know. It was a Peak, and as it rolled up we found 45141 was to be our machine back to Cardiff. Front coach wasn't empty but the first two bays were, so the first table was ours and so was the front vestibule. The colour light went green, a platform whistle shrilled, we were given RA and the brakes came off. A quick blast on the horn, then one, two three touches on the throttle saw the exhaust plume towering above the loco as she found her feet. We eased out of the platform and carefully negotiated the point work. The clamouring of a hardworking Sulzer 12LDA28B was accentuated as we entered the tunnel that led us on to Five Ways. The cutting walls were black with the grime of years of traffic, perhaps only rinsed by the rain since the days of steam. Only the appearance of a few spring flowers and the ducks on the adjacent canal gave any hint of colour to alleviate the greyness. Onward then through University and Selly Oak, the loco easily achieved line speed, eight mk1 coaches swaying behind. As suburbia was left behind, we passed through the leafy outpost of Bournville, home to undoubtedly the nation's best chocolate. Before much longer, we were at Kings Norton, where the Camp Hill line joined. The gloom was increasing, it would soon be nightfall. Unchecked we stormed through Northfield and then Longbridge, where a 31 stood with a rake of car carriers. At Barnt Green we flashed by the Redditch unit, and with full power applied we raced on until we had crested Blackwell summit. The notorious Lickey Incline dropped away before us as we careered downhill, the turbo screeching like a banshee. The driver put the brakes in gently about 3/4 of the way down, and we hurtled through Bromsgrove, rattling the crossover for Worcester. The Peak roared on into the night, gradually checked as we approached Cheltenham Spa, where the loco rested a while. We drew away from the station at a sedate pace, the driver only giving us half the amps, but the reassuring chatter of the exhaust note echoed back to us all the same. The fan cut in for a while, but was soon engulfed by the rising crescendo of the turbo. A stop at Gloucester next and time for Tweeks to dig out the rail atlas. Required track was ahead! The usual Bardic lamp and whistle routine ensued, a tap on the horn, brakes off, full power, shut off, half power, shut off. The train is rolling now, the sheer weight giving the momentum to carry us on. Quarter, half, then full power and leave her wide open as we take the Lydney route. The cold February night air didn't deter us, we had a droplight each in the front vestibule, we'd been gripped and we knew we wouldn't be disturbed again. It was time to savour that Sulzer song without any interference. The exhaust plume spewed white against the black sky, and even a relatively calm 75mph felt like supersonic speed in the cold. The loco was bowling along effortlessly. We clattered through the outskirts of Chepstow and the big machine showed no signs of slacking. The wintry weather we'd seen during the early part of the week had passed over; the sky was criss-crossed with stars. This made it very cold indeed. Common sense would have decreed retiring to the saloon to take advantage of the ETH but when you're 14, out behind a loco you're fanatical about and doing new track in the dark, common sense gets a bit of a kicking. All that mattered to me was 45141 and the joyful noise from the hardworking Sulzer power unit. Caldicot came and went; we were in Wales proper now and the Peak flew through Severn Tunnel Junction. Only 31s, 37s and 47s on shed, so we hadn't missed anything big during our day out. The exhaust billowed from the roof as the driver sought more power from the loco. We hammered past Llanwern and the big machine kept giving more power. East Usk flashed by, the clattering of wheels on rail joints announced Maindee Junction, and before long the drumming of brakes got louder as we slowed for the station stop at Newport. The layover here gave us the chance to warm up before the road was given and we were off again. The huge sound wash from Hillfield tunnel was unbelievably loud, but the exhaust poured down from the roof, which kept us warm. The speed we passed Gaer Jn made us certain that the driver was either clocking off or due a PNB. The loco swayed violently as we crossed the Alexandra Docks Jn point work. Shortly afterwards the regulator was shut off, and brakes were applied. We rolled past a track gang preparing for a possession. The driver tapped the horn and the whole crew gave a show of hands in acknowledgement. Through Long Dyke Jn we set off with determination, the big loco digging her heels in to get us home. All too soon the glare of platform lights at Cardiff Central greeted us, the train coasted to a halt and we disembarked. We took a quick look at the loco that had entertained us so much, and the guard approached us. �You must have been freezing out those flipping windows,� he said, �you could probably do with a blanket, man�, and laughing loudly he threw a tartan travel rug at me before making for the stairs. Thanks also to Mark Harrison for additional material for this page.